The Neem Tree has been recognized as a powerful health promoting tree for ages. Ayurveda has been depending on the use of this powerful herb to cure various ailments since ancient times. In fact, there are enough evidences suggesting use of neem for healing purposes for as long as 4500 years ago. Having its origin in India and neighbouring countries, neem is among the most versatile plants ever. Neem has high therapeutic value, and in Ayurveda, neem is used to balance pitta and kapha doshas. Due to its light, cold and dry qualities, neem aggravates vata sometimes. Therefore, it is recommended in combination with other herbs so that its vata-provoking nature can be subdued. Here’s how neem is used in Ayurveda to promote general health and used for upkeep of a healthy skin and hair. Neem is a great immune booster. Being a strong antibacterial and antimicrobial, the benefits of neem is obtained to the fullest when used in the form of oil, tea, leaves and other derivatives. Therefore, neem is a general tonic for the immune system and is a simple way to protect your health. Neem is an excellent detoxifier. It is particularly beneficial in cleansing ama (toxins) out of the body. Apart from using neem in the form of powder, paste and leaves, it can be consumed as a supplement that helps the body in getting rid of toxins. This is because it stimulates the liver and kidneys for quick elimination of toxins and optimizes the body’s metabolic activities. Neem is effective in stabilizing your blood sugar levels, thereby helping in controlling diabetes. There is a link between less demand for insulin in the body and consumption of neem. The chemical components in this herb optimize insulin receptor functioning and ensure that the body gets the right dose of insulin, which protects against development of diabetes. Furthermore, it is used to minimize the dependence on insulin therapy. A healthy digestive environment is vital for health, and neem helps in keeping the gastrointestinal tract healthy. It reduces the inflammation in the gastrointestinal tract, helping to reduce ulcers and other intestinal disorders such as bloating, cramping, and constipation. It can be used as a quick healing antidote for stomach flu and other infections, and can destroy the beneficial bacteria in the gut. By improving the process of digestion and elimination, it helps in keeping water retention at bay. Neem is very beneficial in keeping your respiratory system healthy. It helps in clear breathing. Neem is a body coolant, and helps in getting rid of excess body heat. 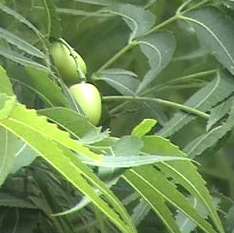 Neem is a popular ingredient in oral health products. Given its antibacterial properties, it is ideal for removing the bacteria beneath the gums that cause periodontal diseases and bad breath. Therefore, it is also a common ingredient in mouthwashes too. Neem has anti-inflammatory properties and hence is beneficial in treating arthritis. When the oil or paste of neem is applied to aching joints and muscles, it is said to considerably reduce discomfort and pain and improves flexibility when used consistently. Neem is rich in antioxidants, which in-turn helps to reduce certain types of cancer. These antioxidants neutralize the free radicals which can cause cancer and other chronic illness in the body. Early research reports indicate a positive correlation between antioxidants and low risk of cancer and heart diseases, as antioxidants are also beneficial in keeping cardiovascular system healthy. Neem is very beneficial for skin when applied topically. Neem oil soothes, lubricates and protects the skin. Neem face packs are very effective in treating acne. Just boil a cup of neem leaves in water until they are soft and discoloured. Strain and store in a bottle when cool. Add this in your regular bath water to get rid of acne, skin infection and body odour. You can also make a neem face pack by grinding a few neem leaves with water and apply the paste on the pimple to treat it. Neem leaves can be combined with other natural ingredients like yogurt, honey and milk to form a smooth paste. Apply this to your face and wash off when dry. Apart from clearing breakouts, this mask can reduce the appearance of large skin pores. Neem works as a great skin toner. Dip a cotton ball in neem water and wipe your face with it overnight. This will help you in achieving a clear skin devoid of acne, blemishes and blackheads. When neem water is applied on a burn, it helps in quicker recovery of the skin, protecting against allergy and infection in the affected area. Generally, neem water is used as a post-chickenpox treatment. The patient is advised to take bath in neem water as it helps soothe the skin and prevent further spread of the infection. Being a coolant, neem helps in eliminating excess pitta or heat trapped in the scalp and hair follicles. It cools the scalp and supports the growth of lustrous, silky hair. Add a cup of fresh neem leaves to boiling water. When it cools down, use this to rinse your hair after shampooing. The antibacterial property of neem treats dry scalp, hair lice, dandruff, and hair fall issues. Make a paste of neem leaves boiled in water and honey, and apply this paste on your hair. Leave it on for few minutes and wash off. This helps in taming frizzy hair. Being a versatile herb, neem can be used topically in the form of oil or a paste, and taken internally as a powder or tablet. Neem is also administered in the powdered form or in the form of tablet as a supplement, or in the form of liquid extract. Ayurveda usually suggests the powdered form for herbs, as once the digestive process begin it signals the body to initiate its supportive mechanisms. Neem seed oil is also available for topical application, which is extracted from neem seeds. This is however potent, and should be used on consultation with a professional. Note: Despite its vast benefits, neem is a powerful herb, and hence, should not be used by infants and toddlers. Those with kidney and liver disorders, diabetes and other ailments, should consult a health professional before intake of the capsules.